Your rhododendrons are lovely. Mine are thinking about blooming but haven't yet. Motherhood is such a gift....you have earned the right to be loved, honoured and cherished. 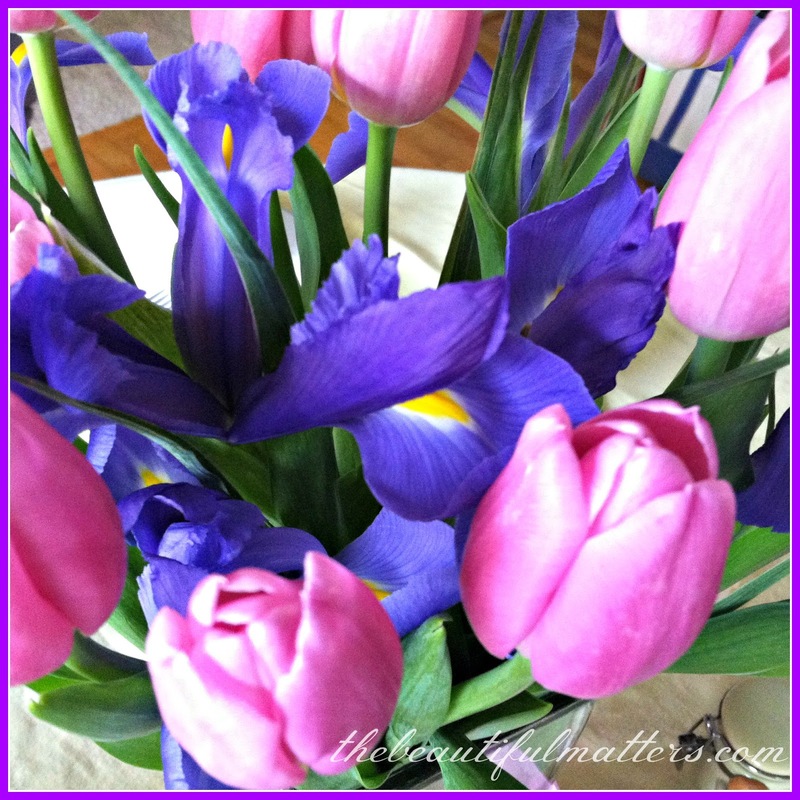 Your husband is very thoughtful to have surprised you with flowers! Hope that you have a wonderful week. I don't always remember my blog friends' locations, and find myself looking back to see the region when there are garden shots (I knew you had to be further north when I saw the PJM rhododendrons - mine have been gone nearly 3 weeks now). Jealous over the hummer sighting, though - still no sighting here yet (in my garden, anyway). Your motherhood story is certainly unique, Deborah, would humble anyone, and certainly would heighten one's awareness of what a gift it is being a mother. Have a great week. Hi Deborah, I'm so glad that you had a nice Mother's Day yesterday. What a blessing you have your children! Thanks so much for sharing you story with us. Have a great day. Royal Albert makes some very sweet sets of dinnerware. I love the ones with flowers and fruit. How Mother's Day for you? Looks cold , it was in the upper 80's here. Please visit my blog. Deborah, motherhood is such a beautiful gift for those of us who have been blessed with children! I cherish mine too and count them as my treasures from heaven! 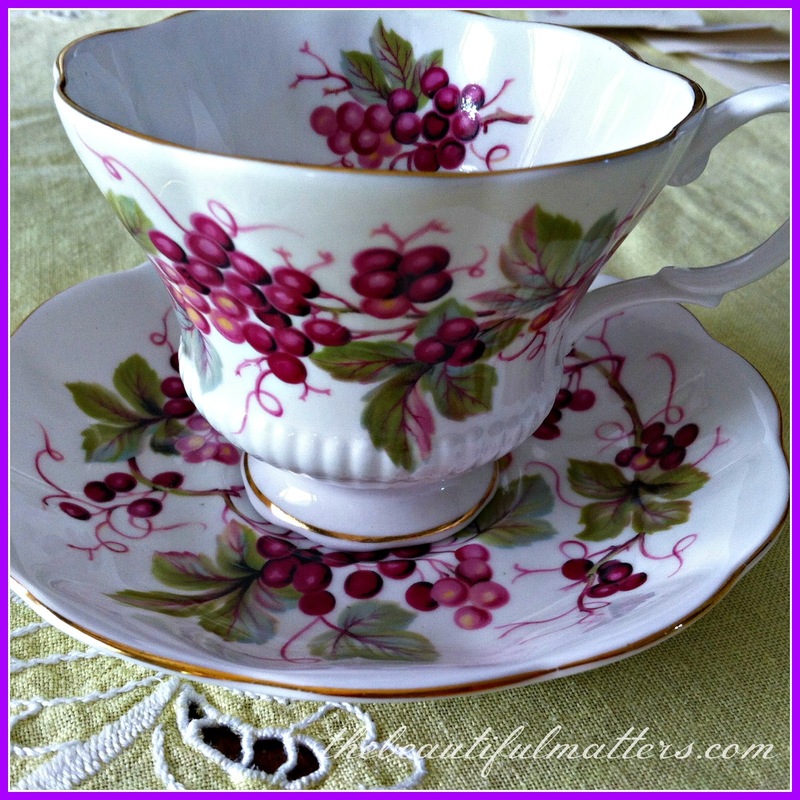 Beautiful teacup and I know you will enjoy that luscious looking cake! Thanks for joining me for tea and have a lovely day. 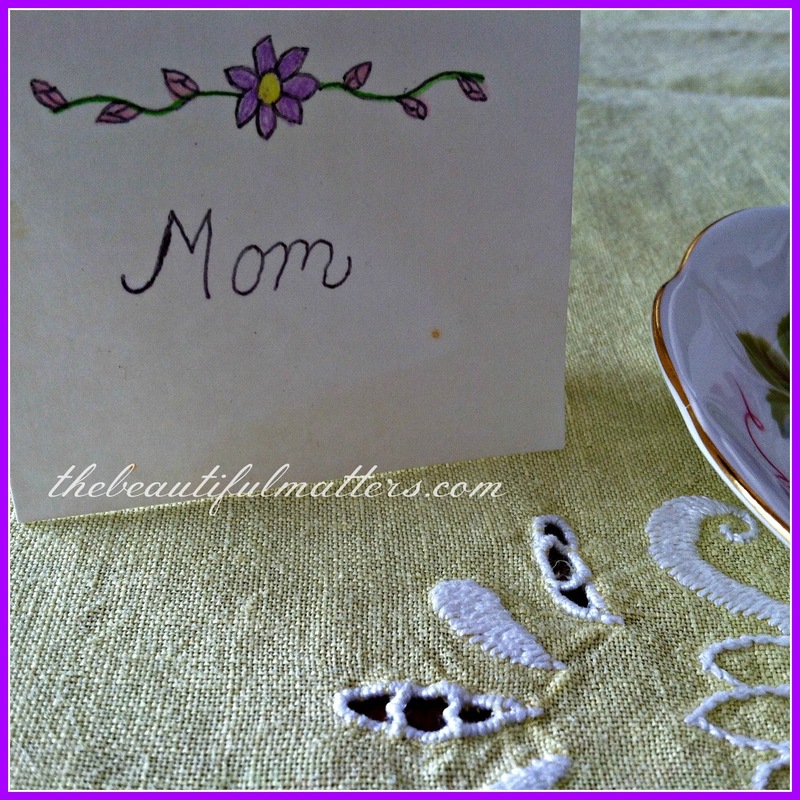 This is a lovely post and I loved the idea of saving the placecards. You shared about that lovely humming bird too and what a wonderful cup and saucer! Such a wonderful post. Lovely cake, cup and saucer and using those placecards again is sweet! 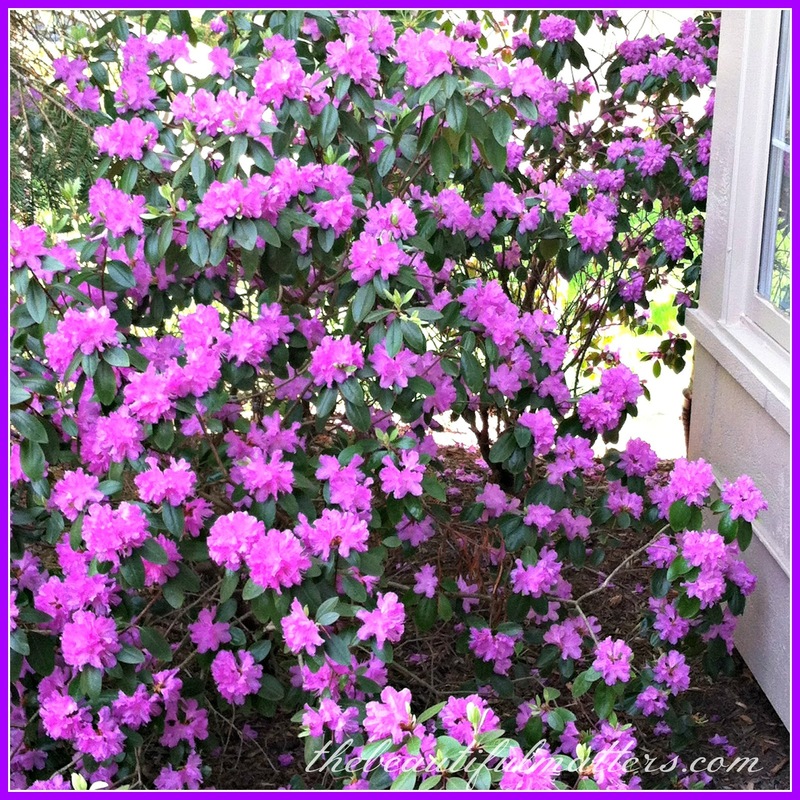 Love the colour of your rhodos Deborah, and they're just covered in blooms! I'm glad you were able to have children and think of them as your treasures, they sure are! 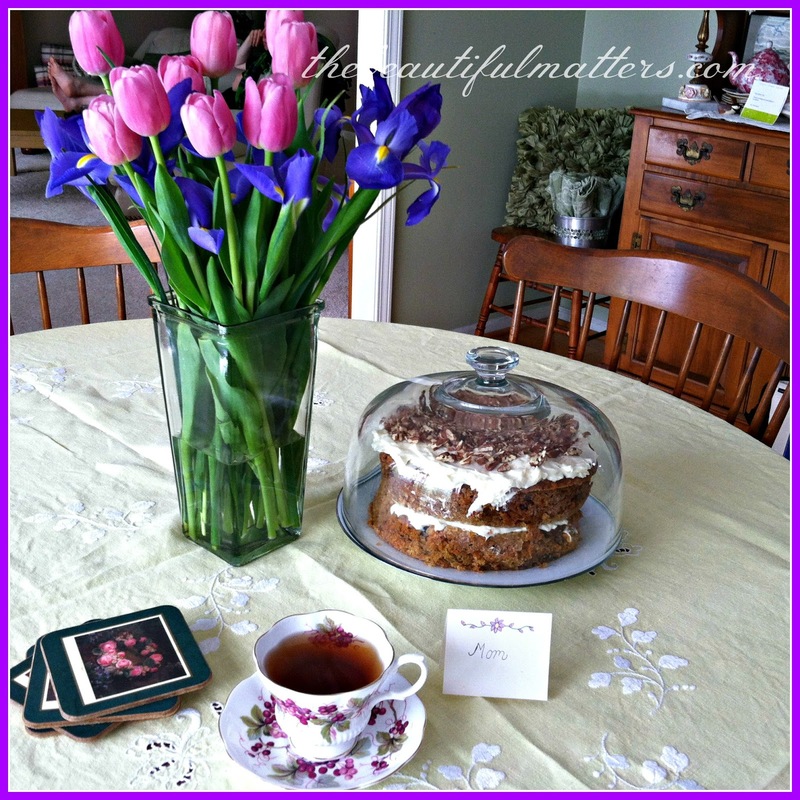 Pretty new teacup and bright spring colours of flowers from your hubby. I'm glad you had a beautiful Mother's Day! And I'm glad you shared your story. The day is not all joy for many people for different reasons. Thank you for the sweet comments you leave for me. It gives me such a boost! Yes, our children are our treasures, my friend. I'm sorry for the loss of your seven, but thankfully you know the joy of motherhood. I, too, had two miscarriages before my four were born. The flowers are just beautiful this year. Your teacup is lovely! Happy Mother's Day to you! Yes, children are a joy. The ones with us here on earth and the ones waiting for us in heaven. Lovely Rhododendrons indeed and your special teacup made for great photos! But the sentiments for this day are quite heavy. Losing a baby boy after one day is heart-breaking. My Mom lived through the first baby's being still-born disaster... At that time she was not even allowed to see her baby; it got taken away from her and Dad did bring my sister in a Blue Band margarine box, on the back of his bike, to the grounds outside of the cemetary where she got buried. Oh my you went through so much to be a mother! :( Your living children are treasures on earth indeed! Oh sweet Deborah, I'm so sorry you had such a sad thing happen to you, it must be the worst thing, as I felt awful with my daughter's school friend who just lost her baby girl after two days and had heart surgery but couldn't survive it! You have an angel in heaven, waiting for you someday! You have amazing taste in teacups...look at this new gorgeous one! I too am having tea in my "new lovely" teacup! I bet you're gonna have a great time with your youngest child and eat carrot cake...our fave around here...God always finds a way to compensate us with our other children! Your Rhododendrons are lovely too. Thank you for sharing your story with us. You never lost hope and God certainly compensated you with your little treasures. I am so happy for you Deborah. What a sweet family. lovely rhodies and I'm so sorry for your loss; the Bible says God captures our tears and saves them in a bottle. I'd rather forget my tears but He knows best. 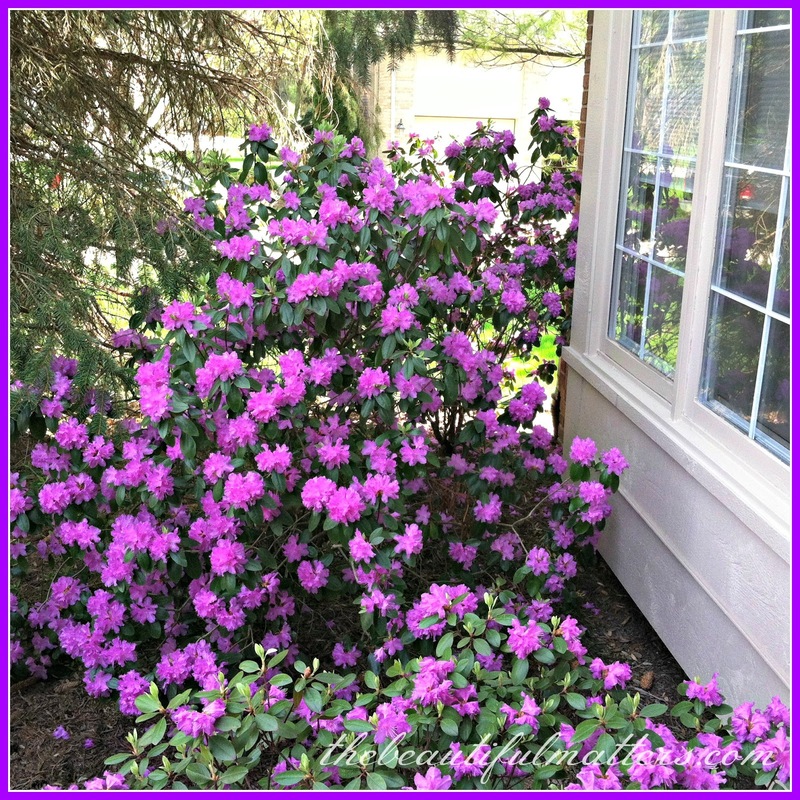 Your blossoming rhodie is gorgeous! I love those -- they grow wild in the mountains where my parents have lived for 25 years, deep in the shadowed areas near the creeks. Happy Mother's Day, a bit late. I'm so sorry about your losses. I cannot imagine the hurt of that. May you see and hold them all again in heaven. Your teacup is to DIE for! !